There are times when a landlord and a tenant cannot resolve a conflict on their own. In these situations, a landlord may take the tenant to court to recover possession of the unit. In most areas, these housing-related issues are heard in landlord-tenant court. Here are the basics of landlord-tenant court. Note: These are general rules and procedures. Every state and municipality will have different rules, so you must contact the local court where your rental property is located to determine the exact procedures you must follow. What Claims Can Be Filed in Landlord-Tenant Court? In general, a landlord and tenant will go to landlord-tenant court when the landlord is trying to evict the tenant from the unit. The tenant has not paid rent. The tenant consistently pays rent late. The tenant has caused damage to the property. The tenant is disrupting other tenants in the building. The tenant has been convicted of a drug-related offense. The tenant has violated other terms of the lease agreement. Before being able to file to evict a tenant for unpaid rent, a landlord must usually send the tenant a written notice to pay rent or quit. For other violations, the landlord must send the tenant a notice to quit the behavior. Once the tenant receives the notice, they have a certain number of days to comply with it, depending on the offense and their state’s rules. If, after receiving the notice, the tenant does not pay the rent they owe or if they do not quit the behavior that is violating the lease, you can then file to evict the tenant. Depending on your state’s laws, you may also have to send the tenant a notice that you are terminating their tenancy before you file for the eviction. Again, this will vary based on the specific rules in your state or municipality. In general, if your property is owned as a limited liability corporation (LLC), limited partnership (LP), or some other corporate entity, you will likely have to hire an attorney to represent you in court. If you own the property in your own name, you will usually be allowed to represent yourself in court if you so choose. Filing a complaint in landlord tenant court is usually a two-part process. You will have to fill out the appropriate paperwork and then pay a fee. You will usually have to go to the court in person to fill out the paperwork to file for the eviction. Some courts make these forms available online. You will also have to fill out general information about yourself and your property, such as name and address. It's required to also fill out general information about the tenant you are filing to evict, such as name and address. You will then have to provide the specific reason you are attempting to regain possession of the unit. Depending on the reason chosen, you may have to provide copies of any notices you have sent the tenant to quit the behavior. In order to have your case heard in court, you must pay the court fee. It will vary, but is usually less than one hundred dollars. After you have filed your complaint with the court, you will usually receive a notice in the mail informing you of the date your case is scheduled in court. It will usually include the time you must arrive, as well as the general court address and specific room number or location where your case will be heard. Whether you are the landlord or the tenant, you must provide evidence that backs up your side of the story. This could include copies of the lease agreement, photographs, rent receipts, notices sent or received, bills, or estimates for damage. The tenant must also bring any back rent or other money owed in case the judge rules in the landlord’s favor. If you are trying to have a third-party witness back up your claim, that witness must physically appear in court on the day of the trial. A signed statement by this third-party witness cannot be used as evidence. 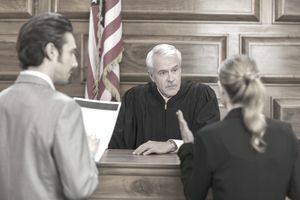 On the day of the trail, before going before a judge, the landlord and tenant will be given the option of meeting with a mediator to settle the case. Often, the landlord and tenant will be able to come to a mutual agreement without having to go before the judge. If the landlord and tenant are not able to settle their case by using a mediator, they will go before the judge. Each side will be able to provide their evidence to back up their side of the story. The judge will examine the evidence and rule in favor of either the landlord or the tenant. If the judge rules in favor of the tenant, the case will be dismissed. If the judge rules in favor of the landlord, the landlord will be granted a judgment for possession. Meanwhile, If the landlord has filed to evict the tenant for non-payment and the tenant comes to court with the full amount of rent owed, the case will be dismissed. What Happens After the Judge's Ruling? If the landlord wins the case, the judge will give the tenant a date by which they must move out of the unit. If the tenant is not out of the unit by this date, the landlord can pay an additional fee to obtain a warrant of removal. With this warrant, the tenant will be forcibly removed or locked out of the unit by a sheriff or other law enforcement officer. It's important to note that If the landlord fails to appear in court on the scheduled date of trial, the case will be dismissed. If the tenant fails to appear in court on the scheduled date of trial, the landlord will win the case by default. This means the landlord will be awarded a judgment for possession as long as the landlord properly filled out the appropriate paperwork. Tenant issues involving money owed can be taken to small claims court. Each state or municipality will have a different maximum amount of money that can be sought in these cases. It is usually between $2,000 and $5,000, but some courts will allow a maximum of $10,000. Issues over the return of a tenant’s security deposit or damage done to the unit often wind up in small claims court.